Eating at restaurants is one of the most common things to do in America, like in many other nations around the world. In every major city there are hundreds of places people can go to get a quick meal or to experience a truly culinary experience. All of these restaurants rely on chefs and cooks to create delicious food for their patrons to enjoy. Some chefs achieve fame, celebrity, and great fortunes through their unique flavor culinary achievements. If you want to be one of these people, going to study culinary arts in the United States is probably the best step you could take. Most culinary art schools in the US teach a variety of cuisines and preparation techniques. Instruction ranges from the fancy haute French style cuisine to Latin American or Asian fusion styles at many culinary schools in the US. This is perhaps the greatest strength of American cuisine: so many diverse backgrounds and foods come together in the kitchens and restaurants of the United States. Culinary schools teach more than how to prepare the perfect steak and potatoes meal. Many specialize in a variety of culinary styles, such as classical French cuisine, pan Asian fusion styles, and Latin American styles. In the many culinary schools found throughout the United States, you'll be taught how to make mouthwatering food, and how to combine this with the business side of managing a restaurant. As with any big decision, you'll need to do a little research on where you want to study, what sort of school you'd like to attend, and how much it will cost you. The many options available may seem a little daunting, but thankfully the basics of getting into culinary school are pretty straightforward. Like any school in the United States, as a foreign national you'll need to have a valid F-1 student visa and your passport from your home country. In addition to your F-1, you'll need to fill out an I-20 immigration form and financial documentation proving that you or your family can financial support you while studying in the US. One exception to this rule is if you happen to be Canadian, in which case you'll only need your passport, have a completed I-20 form and your financial documentation at the border. In addition to the legal documents you'll need, there are several other things you'll need to get before you apply. Most culinary schools in the US require some experience working in a restaurant or formal kitchen. Most schools want you to have culinary work experience so that they can be assured that you are committed to the field and arrive with the building blocks to further your culinary education. It's a good idea to ask your school's admissions director the necessary work experience needed so that you can gain the necessary skills needed to be a strong applicant to the culinary school of your choice. Often times, the minimum requirement is that you have worked at least six months at a restaurant. You will also need to show proof that you've attained the required level of academic progress. Normally, this involves completing a level of schooling comparable to the American high school, or secondary education. You should provide a copy of your official transcripts to the school you apply to, and make sure that your schooling will count for this requirement. In addition to this requirement, you will likely need to have a proficiency in English, and depending on the culinary style you chose to study, other languages as well. Many culinary schools in the US that teach pastry or classical French cuisine for example will require that you have at least some proficiency in speaking and reading French. In addition to your work requirements, you will also need letters of recommendation from people who have seen your work in an academic or culinary environment. A teacher or manager who is familiar with the quality of your work would be the best choice. Lastly, you'll need to ensure that the school you want to attend has the sort of programs and classes that you're interested in pursuing. Just because a school has a degree program in culinary arts doesn't mean that there is a concentration in the particular field you are interested in. Just because a school offers a culinary arts program doesn't mean you'll get to study classical French or Italian cuisine exclusively. To ensure that the program is a good fit, you may want to contact chefs at the prospective culinary school to find out more about the program design and classes. Once you gain the tools at your culinary school, you will have the skills to have a successful career in one of the many fields in culinary. Visit the Study in the USA School search to find schools that offer programs of study in Culinary Arts. 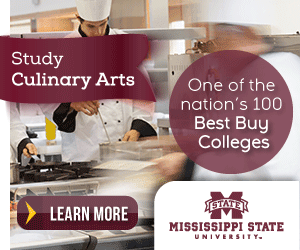 Where to Study Culinary Arts? Over time we will be updating this section and including more information for those who want to study culinary arts in the USA and for other countries, but please feel free to post your thoughts and comments on our Facebook fan page, and also follow us and post questions through Twitter.